Throughout National Catholic Sisters Week, Catholic Volunteer Network will share interviews with volunteers currently serving alongside sisters. In each post you will hear a little more about how the volunteers found their program and what they’ve learned from the sisters they work with. Today we feature Sr. Kathryn Press, ASCJ, from Atlanta Georgia, a graduate from St. Mary’s College, and Aquinas Institute of Theology. 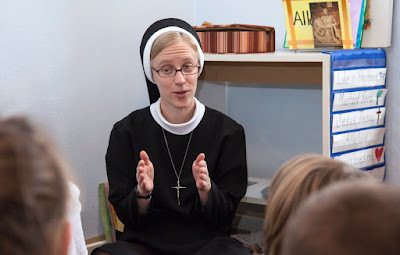 Sr. Kathryn served with the Apostles of the Sacred Heart of Jesus at Sacred Heart Villa Preschool (St. Louis, MO) as a catechist for Catechesis of the Good Shepherd before discerning her own vocation. NOW: Sr. Kathryn Press working in an atrium as an Apostle. Photo credit to Rebecca V. Tower. I met “my” sisters quite by accident when a sister enrolled in graduate school with me and we had class together. From there a friendship blossomed and I learned about the sisters’ ministries in St. Louis. When the opportunity arose to teach with the sisters, I was excited to serve alongside women who were so passionate and caring. 2. What did an average day look like for you? I worked as a part-time catechist but came to school every day. The school uses the Catechesis of the Good Shepherd approach to faith formation. The atrium, or religion classroom, is prepared with the young child in mind. Along with a sister as an aide, I proclaimed the beauty of our faith to 3 year-olds and kindergarten students. 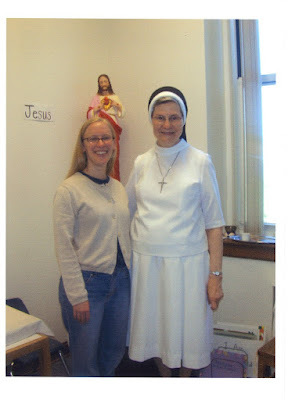 The year I taught with the sisters, I started my application to join the community. The time spent with the students (even the littlest ones! ), teachers, and sisters brought me so much joy! I knew I wanted to give my life away to help others, but I didn’t want to do it alone. I wanted to do it in community–together with others, working toward a common purpose. Only later could I articulate that I was discovering our charism–to share the love of the Heart of Christ! I knew the sisters were dedicated to their ministry. They were waiting at the door for early morning drop-off and at the end of the day too. But teaching with them helped me see a different side. I learned how much they cared for their students, praying for the families and their needs. They lived with integrity. When they said to someone, “I’ll pray for you” I knew they meant it. with superficial zeal, but instead it was something much deeper. Pray to the Holy Spirit and ask to be open to being sustained by God and not by your own efforts. He will do great things through you!